I still remember the day I had purchased this dress almost 2 years ago. I fell in love with the fabric instantly. It was soft, luxurious although the dress itself was inexpensive. I have worn it hundreds of times in the last two years and above are three which were documented on the blog. First has to be my favorite, simply for its simplicity. Although over time I have found it to be a great layering piece for fall and spring. The color too is neural and can be worn year round. If you too are looking for something similar for your wardrobe below are some of the options. I like this tie and dye one a lot. I love how you layered it in the third photo. Super cute. Tres chic! Love all the looks but #1 is my favorite. Your dress is a closet staple! I love all the ways you styled it too! Grey is a great color to wear in winter. 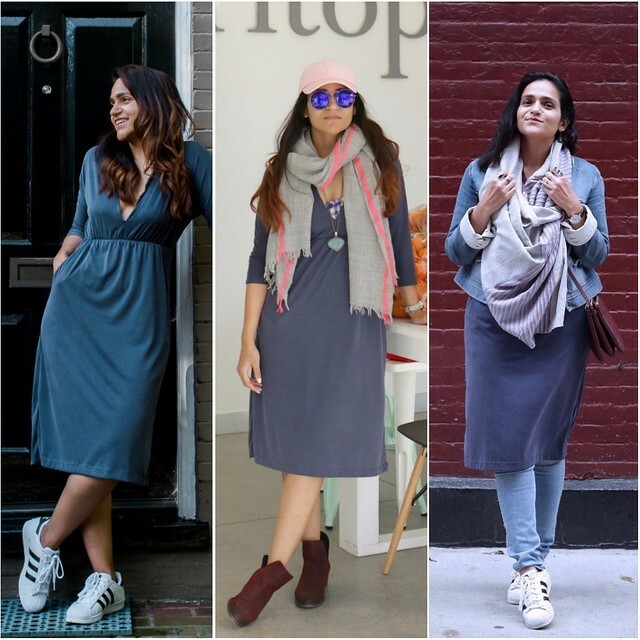 I love simple dresses that you can wear multiple ways. That fabric looks so soft and comfy and I love the different styles you created. I love jersey dresses, the fabric flows so good and it doesn't wrinkle. I like all the looks! Something this comfortable and elegant deserves to be reached for again and again. Happy New Year! This is a cute dress, and I love that you have such a variety for the same dress. Furthermore, I love that you layered it with jeans instead of tights/stockings/leggings. Loveeeee look number two for my casual Fridays at work! This is a cool concept, I might have to recreate this post. I'm a big fan of navy blue dresses. I have a few myself and I often wear them for work. Your dress looks really cozy and comfortable and it can be styled in so many different ways. Perfect! Very cute! I like all three of them but the one with the scarf and the pants is so cute! Lovely looks! I also wear my favorite pieces year round, my friends call me "the queen of layering", LOL it's true, I layer everything! Wow!! I really love your dress. You can wear it everywhere and in style. You look more beautiful on it. I like your style.